The 2016 C7 Corvette already makes its presence known upon entrance. The aggressive, edgy design language is a far departure from the C6 Corvette’s conservative looks. That doesn’t mean there isn’t room to play with the design, though. 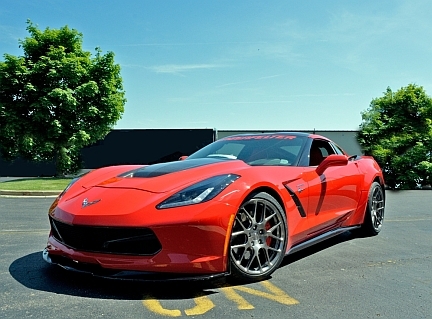 Lingenfelter Performance Engineering has, and it has tickled our fancy with its latest C7 Corvette wide-body and performance kit. Think of this has the one stop shop for aggressive, wide styling and the performance we know and love from LPE. The wide-body kit adds distinctive exterior design cues, including a carbon fiber extractor hood, splitter and rockers combined with its wide-body stance, which flares the rear quarter panels two inches on each side to accommodate larger 20-inch Forgeline Wheels mounted on 335/25ZR20 Continental Extreme Contact EW tires. It wouldn’t be a Lingenfelter Performance product with merely show, though. There’s plenty of go to be found. LPE hops up the LT1 6.2-liter V8 with an Edelbrock E-Force TVS2300 supercharger, Kooks headers and a CORSA Performance cat-back exhaust system. Power climbs to 624 hp and 600 lb-ft of torque at 4,000 RPM, respectfully. “It’s a special edition for Corvette owners that desire a unique look with more power than the factory C7, while remaining well under the Z06 price point,” explains Ken Lingenfelter, CEO, Lingenfelter Performance Engineering. In LPE fashion, owners receive Lingenfelter certification and authenticity of the build, plus a USB documenting the vehicle’s gains after the company’s tuning expertise. The 2016 LPE C7 Corvette wide-body package could be just the thing to steer our eyes away from a C7 Z06, and head for the hills with a fantastic looking, all-encompassing performance package. It appears that only the rear fenders are widened. Why not widen the fronts as well. The wide body look is the reason I bought my C6 Grand Sport. Having both the front and read fenders widened gives the car a very aggressive look. I think my 2011 Grand Sport is much more aggressive looking than the C7 Stingray or Z06.